The bay’s five kilometer beach is ideal for sunbathing, beach volleyball, and long walks or jogging, especially at sunrise or sunset. 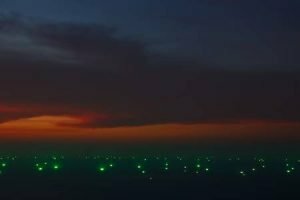 The panorama of the calm, pristine waters stretching to the horizon, dotted with lush tropical islands and colorful fishing boats has a hypnotic, soothing effect on anyone who lays eyes on it. Families will be happy to know that the sea is shallow enough to make it completely safe for kids – waves are gentle, and you can walk 50 – 100 meters out before it gets deeper than your waist. Koh Lam, nicknamed Monkey Island, is directly opposite the resort and is home to over 100 wild crab eating long-tailed macaque monkeys. Their diet consists mainly of crabs and mussels (they know how to use rocks to crack mussel shells), but they are always very grateful for donations of bananas by visitors to the island. Khao Sam Roi Yot National Park was declared as the first coastal park in Thailand in 1966. 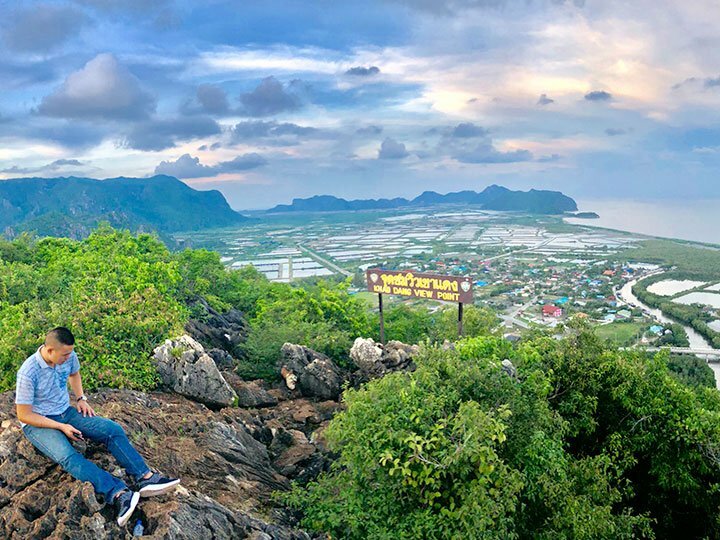 The name Khao Sam Roi Yot translates as “Three Hundred Mountain Peaks”, describing the series of magnificent gray limestone mountains which rise dramatically from the Gulf of Thailand. The park offers fine, sandy beaches, 3 spectacular caves, superb mountain viewpoints, offshore islands, forest trails, boat excursions, and estuarine and mangrove habitats, all within a relatively small area. 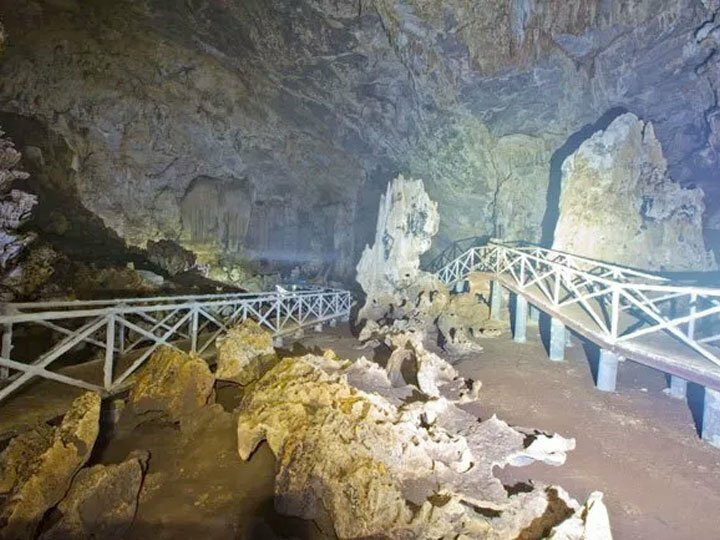 The cave was named for Phraya Nakhon a former ruler who discovered it over 200 years ago after being forced ashore by a violent storm. 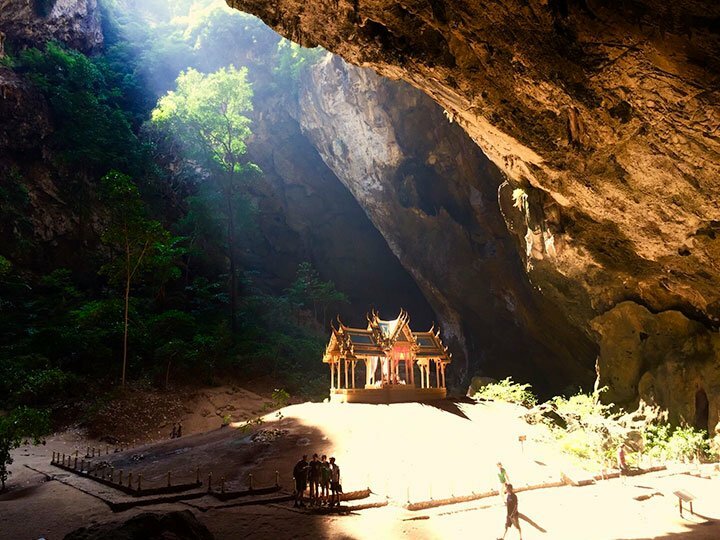 The central focus within the cave is a four-gabled roofed pavillion bathed by natural light, which was built for the visit of King Rama V on June 20th 1890. King Rama VII visited the cave in June 1926, and one can view the signatures left by both kings on the walls. Phraya Nakhon Cave can be reached from Leam Sala Beach, by a steep rocky trail, 430m. long and rising to a height of 130m. taking about 30 minutes to climb. Sai Cave is situated on a hill facing the ocean near the fishing village of Khung Tanot. The road to Khung Tanot ends at the base to the trail, 2.3 km from the main road. A narrow sandy road, runs through the village along the seafront and vehicles can be left near the beginning of the trail. Lamps for exploring Sai Cave can be rented at the parking. The 280 m trail takes approximately 20 minute to climb. Take a lamp and use caution within the cave as there are steep drop offs!.. The cave inside has very beautiful stalactites and stalagmites. It is approximately 1 hour for touring inside the cave. 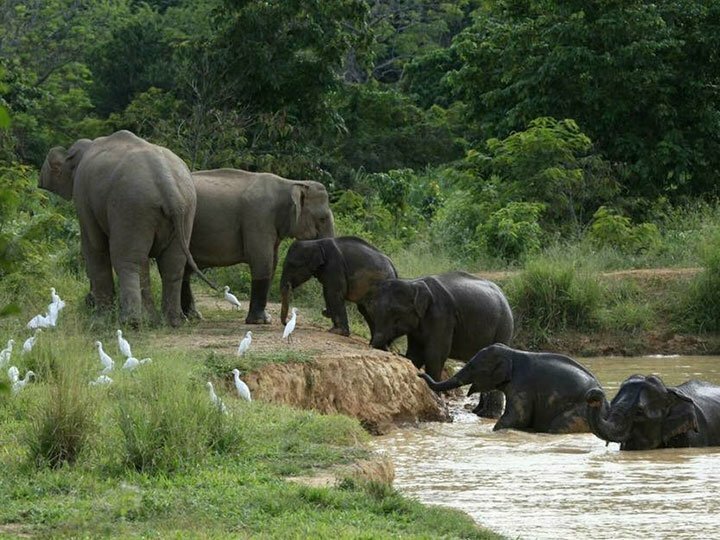 Kuiburi National Elephant Reserve was created by HM the King to provide a place for Wild Elephants to live undisturbed. 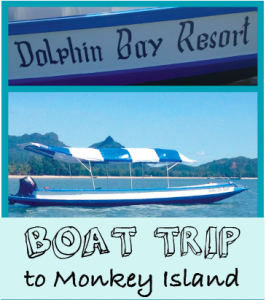 Dolphin Bay Resort now organizes daily trips to the Reserve. We leave the resort at 2.30 pm for a 1 hrs. ride to Ranger’s Headquarters in the Reserve. From there Park Rangers will take us by 4-wheel drive jeeps to observation points where we can watch the elephants at their watering holes. *Reserve, 4-wheel drive rental, and a gratuity for the park rangers. This is a rare opportunity to experience elephants in the wild, so we hope you will join us! is located between the headquarters and the Khao Daeng village. A 30 minute climb up a steep rocky 320 meters trail takes you to the top of Khao Daeng, at an elavation of 157 meters. A panoramic view of the coastal area and mountain scenery are the rewards. The wooded mountain peaks make it a site of unique natural beauty; however it is the fresh water marsh and coastal habitats that give the park its ecological significance. 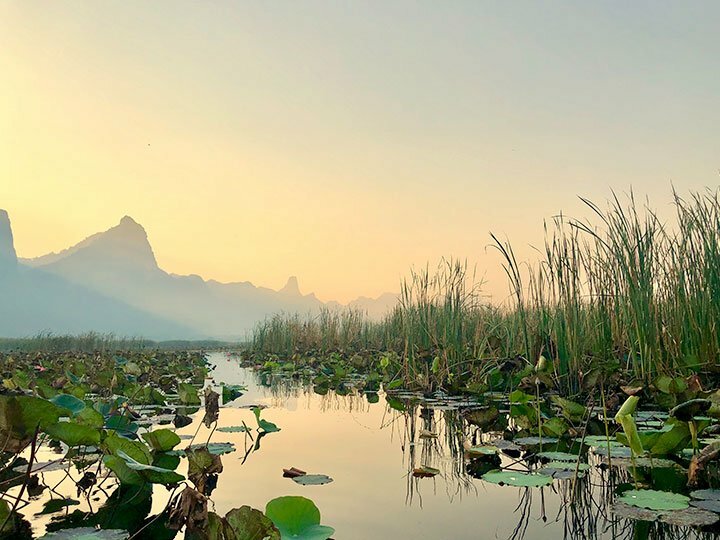 Thung Sam Roi Yot, the largest freshwater marsh in Thailand, is home to over 300 species of birds, and a large number of amphibians, reptiles and small mammals. The world conservation Union (IUCN) has recognized these fragile wetlands as a site of global importance. The Pranburi Forest Park is located at the mouth of the Pranburi River. The park protects the mangrove forest of the Khlong Kao-Khlong Kob National Reserve Forest. It covers an area of 3.17 km² and was established on September 30, 1982. 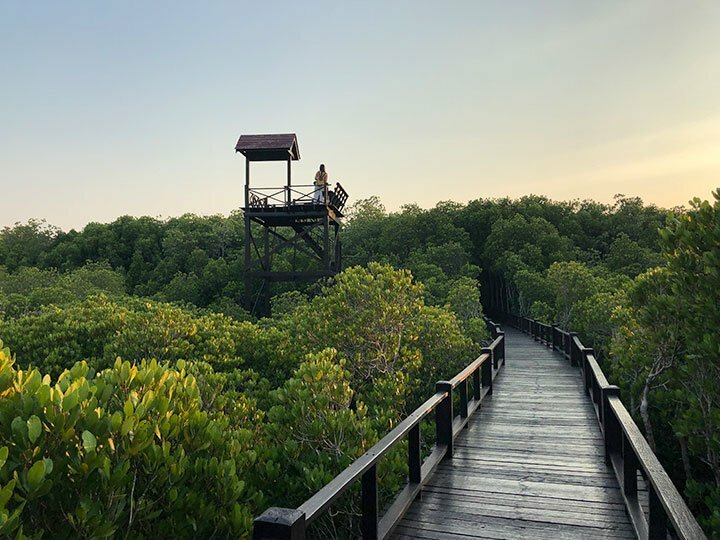 Enjoy watching mangrove forest’s birds and 360 degree panoramic view from Chakhram Tower to view the forest cultivation area. Fishermen from the local villages go out to sea nightly, squid being the main catch in this area. From their boats to our kitchen! The most interesting wildlife living in the bay is of course the pod of Indo-pacific humpback dolphins, five or six of which are pink! They live and breed in the bay for 10 of 12 months of the year and it’s always an exciting experience if you’re lucky to see them close up while swimming or boating. Dolphin Bay is thankfully still a real insider’s secret! Weekend night market with vendors selling art, clothing, decor & handmade goods, plus entertainment.